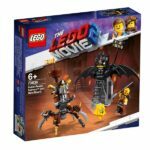 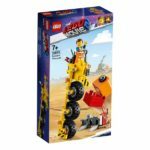 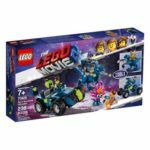 Scuttle into action against Star with THE LEGO® MOVIE 2™ 70836 Battle-Ready Batman™ and MetalBeard. 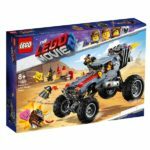 This action-packed Batman playset features LEGO MOVIE pirate MetalBeard in crab mech form, with a built-in LEGO MetalBeard minifigure head, opening treasure chest with MetalBeard’s internal organ elements, flip-down crow’s nest with a flag and posable legs, plus a Batman throne with an adjustable ‘You’re Welcome’ sign. 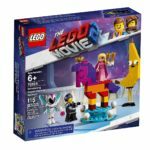 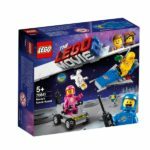 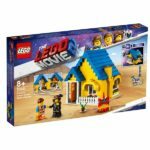 This THE LEGO MOVIE 2 pirate toy also includes 2 minifigures, a brick-built Star figure, and weapons and accessories. 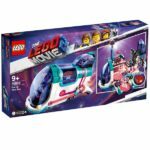 Emmet and Lucy’s Escape Buggy!